From left are Bryant Chamberlain, Cheryl Walter, descendant of Judge Middleton, and Terri Marratta. chair of Champaign County Historical Society’s Educational Outreach. 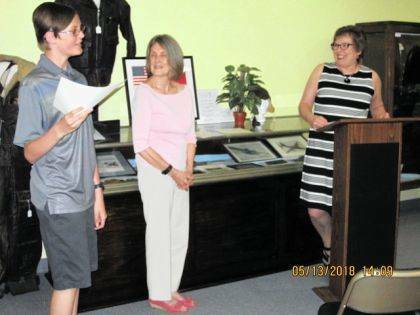 On Sunday, the Champaign County Historical Society recognized state finalists in the National History Day competition during a program at the museum. The Judge Evan P. Middleton Award was presented to all finalists, who also received a one-year membership to CCHS. Students receiving awards were Zoey Cahall, Bryant Chamberlain, Rylie Daniels, Paige Deere, Henry Harrigan, Raegan Hepp, Michael Holland, Hannah Louck, Paige Martinez, Gatlin Ridgwell, Anna and Stephanie Selvaggio, Bree Stouffer, Lily Talebi, Grace Ullom and Jenna Weimer. As awards were presented each student informed the audience of the nature of his or her project. Bryant Chamberlain, an Urbana 7th grader, was chosen to represent Ohio at the National History Day competition to be held at the University of Maryland in June. His project focused on the Toledo War. All Champaign County schools were invited to participate. The Champaign County Historical Society is an all-volunteer, not-for-profit organization that preserves, protects, archives and displays the artifacts that tell the Champaign County story. The society depends on donations and dues to provide a free public museum located at 809 East Lawn Ave., Urbana.